Tyler Lindemier submitted this photo and caption. 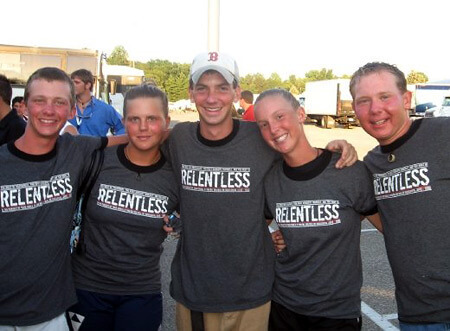 This photo of members of the Glassmen soprano (trumpet) section was taken in the lot after the Glassmen's World Championship Finals performance in 2008. We're all wearing a shirt with the 2008 tour motto "Relentless," which the sopranos certainly were! From the left: Tyler, Kristen, Billy, Heather and Clayton.